Assassination In Galveston Year:1996 Havana, Cuba —— The Conspiracy Following the collapse of the Soviet Union, Cuba faces a severe shortage of goods and a people growing more restless each day. The Castro brothers hatch a dangerous plan to help their ally, Hugo Chávez, become president of Venezuela. Chávez will then supply the oil Cuba needs——at bargain prices. When Chávez’s chief rival announces a trip to Texas, Raúl sends his top agent to Galveston to assassinate the Venezuelan diplomat. 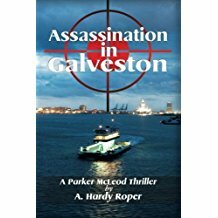 Galveston, Texas —— The Pursuit Parker McLeod, an ex-army intel officer, battles his own brand of demons——alcohol and Gulf War Syndrome——while running a bar on the far west end of Galveston Island. En-route to Galveston, the Cuban agent assaults Parker during a storm. The attack thrusts Parker into a caper he neither wanted nor imagined. The agent, suffering mind-twisting psychoses of his own, engages two anarchist brothers to help him complete his mission. Meanwhile, a beautiful Cuban newspaper reporter arrives in Galveston and enlists Parker’s aid to track the agent. Rushing against the clock, Parker and the reporter must follow a harrowing trail of twists and turns to untangle the assassin’s mission and prevent cataclysmic repercussions for the United States.